Oh my gosh, what a good boy/girl! Very sweet! @Stone_Hedge Would you get another dog? These types of tweets are the only things that I enjoy on my twitter these days. The world is a dark place right now so this is Just to make you smile. A dog playing with a bunny. @GuardianAngel wrote: Oh my gosh, what a good boy/girl! Very sweet! I’ve had three before , all Maltese. That’s a lot of work and money so I don’t think I want to do that again. I have two only because Sasha was 12 and all my others died by or shortly after 12. Like Sasha being the one to help me with the loss of the other dogs, My DH got Baylee in case something happened to Sasha. Something to brighten the day. Cute rescue animals and lots of eye candy. I'm just posting the link since it has all 12 photos on the site and it is just a bit long. @Sprite oh my gosh!! What a great idea, and what fantastic looking guys! Something about a big guy with a little dog I find so sweet! They are all so good looking and all the dogs are so adorable! @GuardianAngel wrote: @Sprite oh my gosh!! What a great idea, and what fantastic looking guys! Yup. I must say the reason I looked, I was hoping Cam would be one of the Aussie firefighers!!! @Sprite that's a good website, so many good articles in there. I was volunteering at a fundraising event for All Breed Canine Rescue this weekend and we got to talking about some of the new flea and tick medications. Apparently there have been some severe side effects with them including vomiting, seizures and even death. This article goes through the symptoms that have been reported to the FDA. We are not using them for any of our rescues. @LoveDovez Awwww that sounds so sweet! No I didn't see that but that's so amazing they were able to able the pug! @GuardianAngel wrote: @LoveDovez Awwww that sounds so sweet! No I didn't see that but that's so amazing they were able to able the pug! @LoveDovez it warms my heart to see such acts of kindness. For them to figure it all out and make it successful is wonderful! Just like the surgeon who did surgery on a young boy, then decided to repair his ripped teddy bear. IDK why but that really touched me. 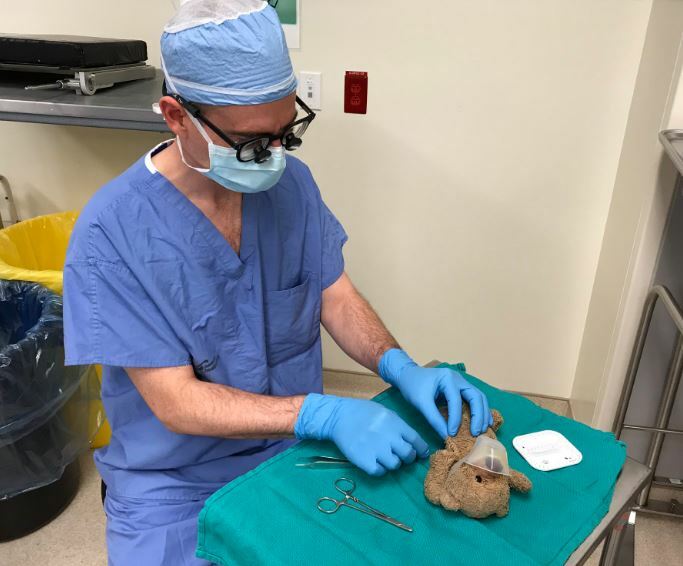 HALIFAX -- A Halifax neurosurgeon has performed a career first, after a young patient asked him to stitch up a beloved teddy bear while the boy recovered from surgery. Like many of Dr. Daniel McNeely's patients, eight-year-old Jackson McKie -- who he's looked after since he was an infant -- brought a stuffed toy to the operating room with him last Thursday. McNeely said he couldn't say no when the boy asked him to fix a tear in his fluffy friend right before his surgery.